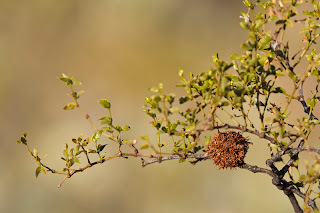 Your Daily Dose of Sabino Canyon: It's a gall! Okay, it's a stretch as a pun, but the photo shows a fine example of a creosote gall nevertheless. A fun description and photo (from an inquiring mind in Tucson AZ), as well as info about the bug that causes these galls to form, are here. Look at creosote anywhere in the canyon and you are likely to find one or more of these in various stages. And now you know they aren't fruits.